The internet, and YouTube specifically, has become such a fascinating place for undiscovered talent to shine, and in some cases they have indeed been discovered by the larger media and placed in the spotlight based solely on their proven ability to shine. Take comedy troupe Good Neighbor, for example; only ten years ago, members Kyle Mooney, Beck Bennett, Dave McCary and Nick Rutherford were posting their short and surreal videos online, but then in 2013 they got the call to be part of none other than Saturday Night Live, with Mooney and Bennett as featured players, McCary as a filmed segment director, and Rutherford as a writer. Aside from Rutherford who left after only one year, they are still to this day working on one of the most popular sketch shows of all time, and not only has it opened their unique style of comedy up to a whole new legion of fans, but their wider appeal has given them the credentials needed to keep making things that only the Good Neighbor troupe could come up with. One of those things, and an indication of how far they have come in the past ten years, is their first feature film Brigsby Bear, which McCary directs and Mooney stars and co-writes, with Bennett and Rutherford showing up in smaller roles. Like their earliest online videos, it takes a bizarre and wholly unique approach to a rather grim and disturbing topic, but manages to make it all work with a playful sense of humour and a surprisingly adorable sweetness to it, making it a lovely little gem that’s absolutely worth seeking out. We first meet 25-year-old James Pope (Mooney) as he’s watching an odd children’s edutainment show called Brigsby Bear, which depicts the adventures of an animatronic bear and his friends going on adventures and teaching valuable lessons like “curiosity is an unnatural emotion” and “trust only the familial unit”. He is clearly obsessed with the show, owning every VHS tape of the show and decking his room out with memorabilia, and posting vlogs about each episode online. 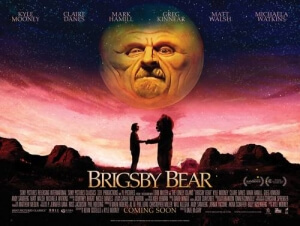 However, one day, police arrive and arrest the people he thought were his parents (Mark Hamill and Jane Adams), and take James away where he learns the horrifying truth: he was abducted as an infant, and kept safe in their underground bunker where his father had been subduing his false son all these years by making the Brigsby Bear show himself. However, despite being reunited with his real family and integrated into a society he never knew up until now even existed, James can’t shake his obsession with the show and decides to complete the series by making his own movie about the character, with the help of his sister Aubrey (Ryan Simpkins), his new friend Spencer (Jorge Lendeborg Jr.), and even the kindly Detective Vogel (Greg Kinnear) who had been working on his missing case for years. From an outsider’s point of view, this probably sounds really disturbing and not exactly a gold mine for legitimate comedy; however, it’s well-written enough that the humour always manages to shine through despite some of the more messed-up parts of the story. Mooney and co-writer Kevin Costello cleverly allow us to understand why, despite everything he’s gone through, this character would do all this stuff or not even harbour any grudges towards the people that have wronged him his entire life. James has the mental and emotional mind-set of a socially-awkward child, despite being fairly smart thanks to the show’s teaching of advanced calculus, and although Brigsby Bear wasn’t created with the best of intentions for its audience of one it is still the only thing James holds dear to his false nostalgia, so by going into the art of amateur filmmaking he is expressing his passion for this subject and winning over people who share his passion. As for his abductees, they don’t seem to have ever been cruel or abusive towards him, and of course for the first twenty-five years of his life he was under the assumption that they were indeed his parents, so there never seems to be any anger on James’ part; just confusion and genuinely innocent naivety that’s spurred on by his sudden reintegration into normal society. The script really allows you to understand this character’s way of thinking, and it never feels phony or forced but rather sincere and genuine. You can tell, as well, that this film was made out of love for its themes and its overall uplifting tribute to movie-making, similar to how The Disaster Artist both celebrated and found humour in the ups and downs of the process. Director McCary keeps the humour grounded and playfully consistent, while Mooney delivers a sweet and heart-warming lead performance along with the rest of its likable cast, but the biggest piece of its heart is how the simple task of making a movie can bring someone out of their shell, especially when he’s surrounded by like-minded people who also want to make his story an on-screen reality. The power of movies is how they bring people together, whether it’s through discussion or a shared love, and this movie puts a wholly original spin on that which is not only adorable but also sincere and un-cynical. Should you be fortunate to have both this and The Disaster Artist playing at your local cinema, a double-bill in whichever order you see fit is in order, as you’ll be seeing two wonderful films about the highs and lows of filmmaking, but how in the end it always manages to bring people closer together regardless of the quality. Brigsby Bear is an utterly delightful gem that takes a rather dark subject and turns it into an uplifting, sincere and wholly original spin on how the art of movie-making can bring people closer together, which is supported by a likable cast, consistently funny humour and smart writing that allows you to understand the lead character’s odd motivations.